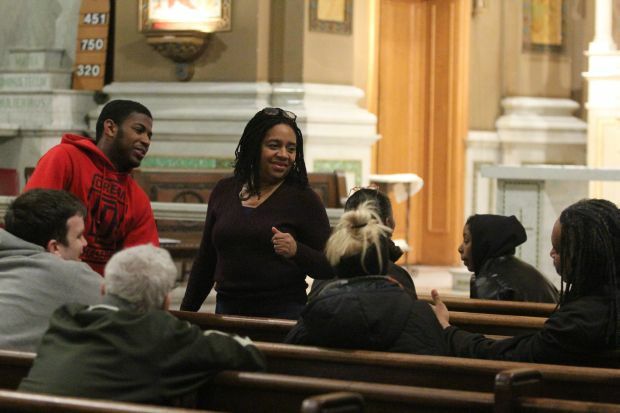 Stacy Williams gives direction to the players during rehearsal at St. Malachy Church. 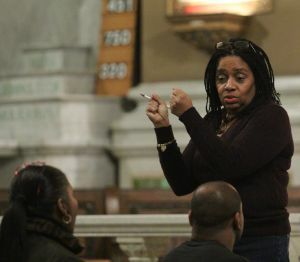 As pastoral associate at St. Malachy Parish in North Philadelphia, Stacy Williams has a lot on her plate. Whether it is RCIA or other catechesis, social outreach including the food cupboard, she is there to do whatever Msgr. Kevin Lawrence, the pastor, needs done, including answering the door or the telephone. 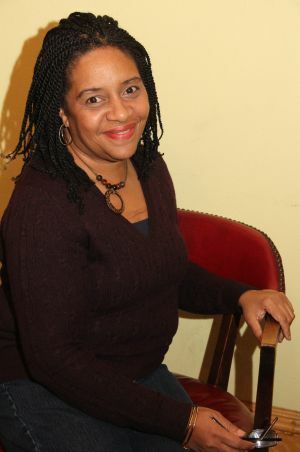 Now she is even producing a play she has written, “We Shall Overcome,” concerning the roots of the modern civil rights movement starting in the post-World War II era in the South. St. Malachy, as a parish, traces back 164 years to 1850. For most of that time it was heavily Irish, with a huge congregation and quite prosperous. In its heyday, Bishop Edmond Prendergast was the pastor before he became archbishop of Philadelphia. Today’s St. Malachy is modest in size, less than 500 total Catholics and on paper almost entirely African American. But it is a pleasantly welcoming parish, and there are always worshipers of different ethnicities who have come from afar just to be at the Sunday liturgy. Like so many African American Catholics, Williams has a mixed Protestant-Catholic heritage. “My great grandmother was a church mother in a Baptist church,” she said. She is originally from St. Charles Borromeo Parish in South Philadelphia, where “my grandmother, Jenny Ruffin, was a convert,” she said. Williams recalls her grandmother and her best friend Louise Boggs were the pioneer Black Catholics in the parish, and not warmly welcomed by everyone. Her mother was Catholic but her father was not. Nevertheless, she was raised Catholic and attended St. Charles School, where she was taught by St. Joseph Sisters and afterwards St. Leonard’s Academy, conducted by the Holy Child Sisters. The biggest difference was the St. Joseph Sisters still wore habits while the Holy Child Sisters were in secular dress and some even had long hair. Although Williams did not herself consider a religious vocation, she had fond memories of the sisters of both congregations. After that she went on to Williams College in Massachusetts where she received her degree in psychology. Coming home to Philadelphia she worked for a year as a counselor in a school for delinquent boys, then switched to elementary education – very briefly in public schools (“about 10 minutes,” she quipped), then in Catholic schools including St. Charles and St. Raymond. Coming home post-college did present a spiritual challenge. “There was no one in church in my age group, and the church seemed to be dying,” she said. She fell in love and her fiancé, James Crews, was an active member of a Baptist congregation. She began attending church with him and he would also attend Mass with her and they both sang in an ecumenical choir. Williams was heartbroken when James died 22 years ago, and although that made her decision to remain Catholic easier, it was not the primary influence. She was teaching little children about their Catholic faith, and part and parcel of that was encouraging parents to set the example by going to church themselves. “That made me examine my own life,” she said. Gradually her Catholic faith became more and more the center of her life. She was still teaching when Msgr. Lawrence asked her to become a part-time DRE at St. Malachy. Her play “We Shall Overcome” isn’t just about the civil rights movement; it is about the movement as seen through a Catholic lens. Part of it takes place in New Orleans, a city where Catholicism has been traditionally strong among both white Americans and African Americans. During the late ‘40s there was a movement by college students at African American Xavier College (now University) and students at all-white Loyola University to foster integration, initially through Mass and perhaps some sports. The time wasn’t ripe and there were concerns about this voiced from many quarters, including New Orleans Archbishop Joseph Rummel. All of this is part of the play. What isn’t included because of the very specific time period it covers is that not long after this Archbishop Rummel became more and more convinced racial segregation was wrong. Despite local public opinion he forced the integration of church congregations and the schools, even when as a last resort it became necessary to publicly excommunicate several die-hard segregationists. “I discovered this during my research and it was a good lesson for me. I had never heard that,” Williams said. “Although he questioned integration at first he became convinced it was wrong. He is a real hero. This is not in the play, but it is in the booklet that goes with it. The conviction that the Catholic faith is where she belongs has become stronger and stronger. 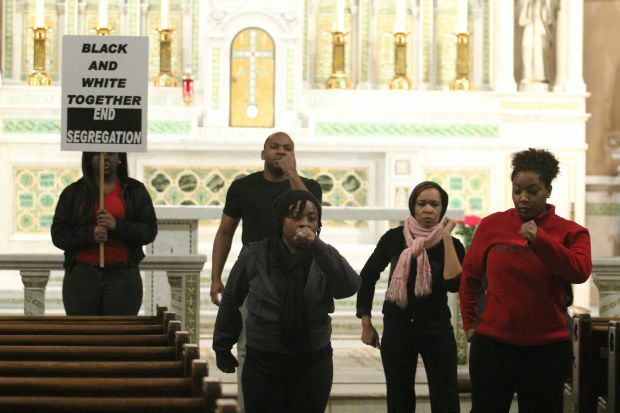 Parishioner-actors rehearse a scene from “We Shall Overcome,” a play examining the civil rights movement from a Catholic perspective, to be performed at St. Malachy’s March 23.